Save 50 cents/bag when you buy 2 or more. If you are still searching for the perfect scone, look no farther. Add both butter and buttermilk to our Original Recipe Scone Mix, and you create buttermilk scones that are truly something special. Each scone bakes up with a crunchy exterior and a light and tender interior. “Plain” they only need butter and jam (or lemon curd and clotted cream) to be your new favorite breakfast treat. There are two things that make this scone mix and these scones even more noteworthy. First, it is the perfect ‘base’ mix and dough. You can add fruits, nuts, spices, cheeses, or purees to the dough to create any flavor you can imagine. We list the directions for several of our favorite flavor variations on our Recipes page. 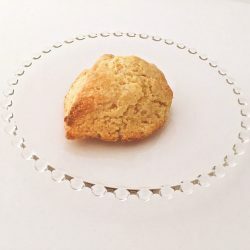 Included in that list are scone flavors such as Cinnamon Streusel, Blueberry and Goat Cheese, and Lemon Ricotta, to name just a few. Second, you can freeze the scone dough and then bake as needed. Freeze the dough as individual, pre-cut, ready-to-bake scones. When you want to bake, preheat your oven and then take the dough from the freezer. Place on a parchment paper lined cookie sheet and bake. It only adds 3-4 minutes to the total baking time. To ready more about freezing scone dough, please click here. Flavor variations, and a conversion to vegan scones, can be found here. Each bag makes 16 scones. Unbleached wheat flour (wheat flour, niacin, iron, thiamin mononitrate, riboflavin, folic acid, enzyme), sugar, baking powder (sodium acid pyrophosphate, sodium bicarbonate, corn starch, monocalcium phosphate), baking soda(sodium bicarbonate), salt.